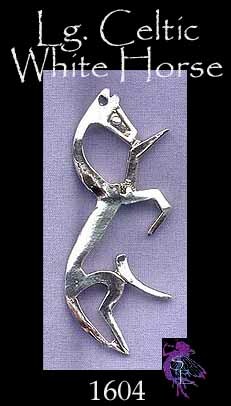 Size : 2-1/2" x 1+"
Uffington White Horse Symbolism / Epona - Among the Ancient Celts, the Horse was considered a symbol of chieftainship. This beautiful shape was found carved into a hill and now stands as an eternal symbol & monument to an ancient heritage and belief system. In Celtic Mythology, the mare is associated with the Goddess Epona.